Successfully Added Bluetooth Smart Watch - Phone Calls, Messages, Pedometer, Heart Rate Monitor, 1.2 Inch Touch Screen, Sleep Monitor (Black) to your Shopping Cart. This stylish Bluetooth smart watch with its 1.2 Inch IPS display allows you to conveniently enjoy all your smartphone’s features straight from your wrist. 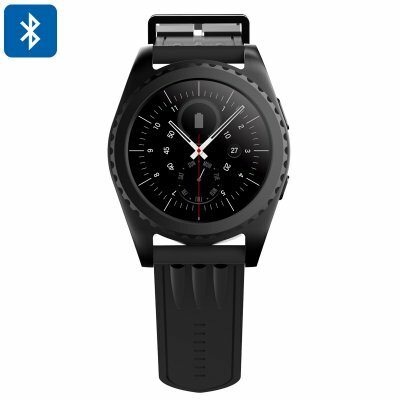 Supporting ultra-fast Bluetooth 4.0 connectivity, this Bluetooth watch lets you easily pair it with your iOS or Android smartphone – bringing along great on-the-go efficiency and connectivity. When paired with your smartphone, this Bluetooth smart watch informs you about incoming phone calls and messages which can be answered immediately through the Bluetooth watch itself thanks to its intergraded microphone and speakers. Unlike a watch phone, this smart watch does not hold a SIM card but rather allows you to engage in hands-free Bluetooth phone calls. Besides bringing along great connectivity and efficiency, this Bluetooth watch also features numerous smart health and fitness features that allow you to work towards a healthier future. A built-in pedometer will keep you constantly updated about the distance you covered throughout the day and a sophisticated heart rate sensor provides you with valuable information on how to adjust the intensity of your upcoming workouts in order to meet your future fitness goals in the fastest and most efficient manner. Additionally, it also comes with a sleep monitor that makes sure you’ll always get the rest needed in between your workouts – stimulating fast recovery and muscle growth. Packed within its sleek body, this Bluetooth sports watch holds an epic 380mAh battery that brings along 8 hours of continuous usage time and 72 hours of standby time. Whether you use it to engage in hands-free calls, enjoy its smart fitness features, or simply carry it along to check on the time – this smart watch will get you through several days without needing to worry about battery life. With its stylish and thin design, this sports watch can be worn with confidence at any occasion. Whether you’re at home, in the gym, or at work – it is guaranteed to bring along great efficiency and to meet all your fitness and mobile connectivity demands.